T. P. Gopinath; Nov 04, 2016. As a school going child, Calicut was the biggest city i had known. Father regularly went to Calicut as part of his work and once in a while he used to take me with him. Every time i went along, I was amazed by the city that never slept and always kept busy with people moving in a fast pace. Today, i have travelled to all the major cities in India, However the amazement of the trips to Calicut during childhood and accompanying father, holding his strong hand with my little one, is a distant memory I cherish. His routine visits to Calicut and late night return always culminated in bringing home some fruits and sweets for which as small children we used to wait delaying sleep. 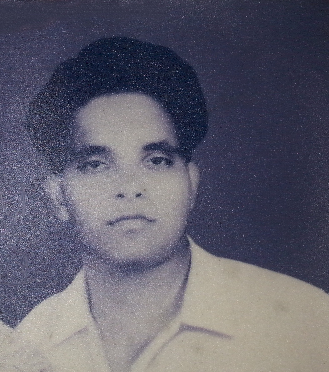 My father – A photo taken soon after his marriage. As i grew up, fathers focus turned to my studies and there was not a day he refrained from scolding me for not studying or sleeping early. I had to rise early and travel 50 Km on each direction to Calicut city every day, while I was in college. Notwithstanding my tiredness by the night and overruling mother, he continued to believe that mine is a life wasted and that i can never be corrected, at least that is what he used to say. However, at that time and in that age, as any other child, I have hardly understood the need to study in spite of all the constant lectures from both parents. I was also the distinguished child who ended up receiving maximum physical punishment; most often triggered by my firebrand younger sister. On one occasion, I remember running a few rounds around the land where our house is situated. Finally when he caught hold of me after quite a run, I received the severest beating, even on that incident, the root cause was a fight with my younger sister. My father did not have much love for the music which I loved deeply. Reading was his main pursuit. He read widely in Malayalam and English. Once in college, one thing that i distinctly remember about my father is his untiring persuasion to make me read the Hindu Newspaper which i hated to the core and he devotedly read for hours together. He believed reading Hindu will improve my abysmal English skills. On a daily basis, he used to watch closely whether I and my elder sister read the newspaper. If we lie that we read the newspaper, he will open it up and try to find whether we are lying. Sometimes, advertisement leaflets would fall of the paper and he would scold us because if we indeed read the paper, advertising material wouldn’t be just inside folded neatly. When you are young and boiling with the teenage excitement, you hardly understand what your parents are nagging about all the time asking you to study. But my father never let me off the hook. He was behind my studies all the time and I never succeeded in complying the way he wanted. Father persisted on me and my elder sister about reading the newspaper and we paid no real heed both due to poor English skills and also due to lack of interest in any subject that newspaper story was about. However, his pursuit was relentless. Slowly my sister was excused and I reached a stage where I started reading some bit by bit tired by his relentless pursuit. Unfortunately, Hindu newspaper had one of the toughest language. Around the same time, while I was at the college in Calicut, it was cricket fever and I couldn’t understand the English commentary either. Slowly and steadily I changed and started paying attention to my poor English skills and the interest turned to a genuine and sincere one over time. Any interest was inculcated by my father’s relentless pursuit. He was never tired, never thought it was waste of time, never thought his boy was beyond repair. He must have had a ray of hope that I would amend my ways and start reading in earnest. That effort initiated by him by forcing me to read Hindu on which I made little progress for a few years did not force him to give up. He persisted in his scolding and advice. Today on hindsight I can never thank him enough for what he had done to me on that single matter besides all the love and care that was never seen on the surface. On the exterior, as many fathers are, he was that father who was very harsh and rarely mentioned a word of appreciation. There was nothing to appreciate in me, though. It is when he is not there, today, that I realise how much he meant to me. When I was on deputation duty in Delhi HCL, I remember once writing to him in English which I thought I did extremely well. I was afraid whether I did better than he could do and whether it would make his English feel inferior. When the reply came in English, he not only brought to notice the mistakes I made but his reply was written in impeccable English. I then realised his old 10th standard is unmatched by any English knowledge that I have acquired till then. His effort in pushing some English down my throat through constant effort helped me clear the HCL campus interview at the Calicut college which almost 80 students including lecturers from the computer department appeared. In the end, only four or five of us made it. I was an average student at that time and my budding English had played an important role in that selection. Father passed away while I was just a year in the Gulf giving up on his long but intermittently successful battle with Multiple Myeloma (cancer of the blood’s plasma cells). I have always felt guilty that I could not look after him when he was not well. In fact it was after his death that I came to know he was afflicted with the dreaded disease. He was a fearsome father but it is when I grew up I realized that he instilled fear to make sure that his children’s character was not malformed. An individual’s upright character is the single most important contribution any parent can gift to his offspring. Any good in me today is clearly attributed to his tough upbringing; any bad being my own creation. I travelled to India to see him for the last time two years after I first came to Gulf. A father’s mere presence alone makes a gulf of difference in any man’s life. Once he is gone, so much is gone. October 16th, 1996 is when he gave up the battle for life. Let me choose this day that just passed, to reminisce his greatness and declare my love for my dear father. Due to the need for resolution of some important matters that rendered me tense for last few weeks, I delayed posting this story. However, there is his thought that is constantly alive and any post is just an additional declaration of my adoration and respect. Years later, today, I am subscribed to the digital edition of the New York Times which is the ultimate newspaper. I also read widely on variety of subjects from politics to medical science. But for his hot pursuit in the childhood, I am certain this genuine love for reading which allows constant learning would not have been there. Photo I could find from his young age is faded, but the memories can never be. T. P. Narayana Kururp as my father was popularly known had worked all his life for the benefit of the family as most fathers do. I have rarely seen him brimming with joy or taking part in any kind of entertainment. He used to carry home for extra hours work, large books from the co-operative department bank he worked as an auditor. At a time when PCs and software was not around, he had to go through hundreds of pages of account books manually, to do his job. We all live a life for someone else. In fact I believe, as Mother Theresa once said “a life not lived for others is not a life”. Knowingly or unknowingly, most noble lives are devoted to the progress of others around the individual. Article is inspired my dear friend and class mate Ganesh’s writing on his father. “A father’s tears and fears are unseen, his love is unexpressed, but his care and protection remains as a pillar of strength throughout our lives.” – Ama H. Vanniarachchy.